Mustang shoes, hardware and drums are easy to replace. This section will go through the process of removing the rear brake drum,hardware and brake shoes and getting the new brakes back onto a 1965 or 1966 pony car. 1. Use the tire iron to slightly loosen the wheel nuts prior to jacking up the car. 2. Jack up the rear of the car with a hydraulic jack or your original Mustang tire jack. 3. Place jack stands under the axle for safety. 4. Remove the drum by pulling slightly side to side. If this doesn't work,because of rust at the hub,you will probably need to carefully hammer the back edge of the drum. 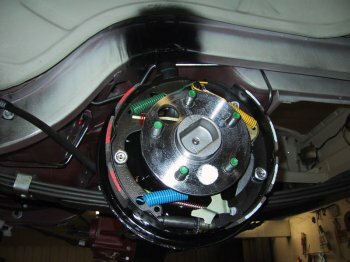 On my 1965 coupe, it looks like the previous owner put new shoes onto the car without machining the drum and as it wore into the metal,it caused the shoes to lock into the groove, making it necessary to pound it out with a chisel. 5. Using vice grip pliers or a brake hardware removal tool, take off all the springs and retaining clips, noting where it all needs to go back. 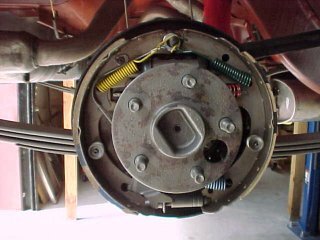 Oh,and if you forgot to do that,these pictures of Mustang brakes for non disc cars can help get them back together again without spending the next hour searching all over the net. 6. Clean off all surfaces with aerosol brake cleaner and using a non drying lube, lubricate the flat boss areas of the Mustang drum to help allow the brake shoes to slide freely. 7. Reverse the order, making sure all hardware is snug,and that the star adjuster wheel has been lubed and moves freely. 8. Adjust the brakes so that the Mustang shoes almost touch the brake drum and then install the drum. If you leave the shoes too loose, at best they'll take a long time to self adjust, and at worst, in the process you can destroy the lining from the material slamming into the drum from too far a distance. 9. Replace the wheels and lug nuts, and test your brakes. Note: Did you check your emergency brake cables? Old brake cables can get frozen inside their housings, so make sure you've checked this out. Otherwise, your perfectly good brake job will be missing its e-brake! Give it a try. Its something you can do yourself and save some coin in the process. Need brake parts? Click the link to jump to the classic Mustang parts section to find Mustang shoes and brake parts.